THE EU has voted to exclude Gibraltar from draft EU aviation legislation. MEPs have voted to exclude the Rock from the Single European Sky legislation, which is designed to harmonise air traffic control around Europe. As a result, Gibraltar will have no say in safety and regulation measures designed to make Europe’s airlines more competitive, share airspace and reduce pollution. It might also mean that there could be complications for flights coming in to Gibraltar if they need to liaise with Sevilla’s air traffic control. The vote is the latest in a series of moves by Spanish Prime Minister Rajoy’s Partido Popular government to annul the Trilateral Forum. The Cordoba agreement of 2006 included Gibraltar in the EU’s ‘Single Sky’ programme. The first draught will now be debated by the new European Parliament which is due to be elected in May. A spokesperson for the British Government said that it was disappointed by the vote and described the position as ‘inconsistent’ with EU treaties that state that Gibraltar is part of the EU. It is also contradictory of recent legislation on Air Passenger Rights, where the European Parliament amended the legislation so it applied to Gibraltar. “The UK cannot accept a return to the pre-2006 practice of suspending Gibraltar Airport from EU aviation measures,” the UK spokesperson said. The Gibraltar Government underlined the inconsistencies. “Gibraltar will be excluded from the Air Passenger Rights legislation by the Commission, but then included by the Parliament,” said a spokesman. If I were you I’d concentrate on not losing Catalonia and The Basque Country. I would be more than happy to see Cataluña become an independent communist state ruled by ERC and outside the EU, but regretfully the Spanish Constitution is in the way. With respect to the boycott you propose, more than 50% of everything that is produced or manufactured in Cataluña is sold to the rest of Spain, so it will be interesting to see who boycotts who. Some people from the UK still fail to understand that the issue of Gibraltar is not about phony patriotism, but about the anomaly of one European nation having a colony on the soil of another European nation. Spain will never give up its claim on Gibraltar and sooner or later it will be returned to the motherland. Oh boy! Go for it Fabregas. It’s well-known that Catalunya is the work-horse on the Iberian Peninsula. You’ve nothing to lose and everything to gain by getting the rest of Spain off your back. Catalunya historically spills over to present-day France and will have no problem trading with them and the rest of the E.U. Okie dokie Mr. Fabregas, good luck to you! I must congratulate the editor for printing this article. It has generated a great number of comments and deviated from Gibraltar airspace to independence for the Catalans. Further Beyond has not contributed lately. He must have run out of paste for his cuttings or he is already on Spanish Foreign office leave to be combined with Easter week. Such productivity! Anselmo and Ciudadanos are still there. They probably live in UK so they have to work. We had a comment from a new contributor called Espanol. He stated Gibraltar would become Spanish “o por las buenas o por las malas”-by fair means or foul. Considering his country is crumbling politically, economically, socially and militarily I don’t think he is in a position to threaten. But there you go, the Don Quijotes don’t die in Spain. The marriage of Isabella I of Castile andFerdinand II of Aragon (1469) unified Christian Spain; in 1492, the last of al-Andalus was conquered and the Spanish conquest of the Americas began. Political power began to shift away from the Crown of Aragon towards Castile.Over the next few centuries, Catalonia was generally on the losing side of a series of wars that led steadily to more centralization of power in Spain. The most significant conflict was the War of the Spanish Succession, which began when Carlos II died without a successor in 1700. Catalonia supported the claim of a member of the Austrian branch of theHabsburg dynasty (after breaking an oath of loyalty to Philip V from 1702), while the rest of Spain generally supported the French Bourbon claimant, Felipe V. Following the final surrender of Catalan troops on September 11, 1714, Felipe V’s Nueva Planta decrees banned all the main Catalan political institutions and imposed military-based rule over the region. So we will be happy to have it all back….. many thanks. @stefanjo – great to see intelligent comments its refreshing. @el fifi – your observations are great, please keep them coming. @the fascists – well youv pretty much ran out of steam and would be worth working on your own country…catalunya no is spain and never will be…..the people decide.. good luck with what you’ll have left…. Mr. Fabregas, do you think that your new found friends (Fifi, Stefanjo, Stuart Crawford) would like to be governed by ERC (Esquerra Republicana de Cataluña)?….I don’t think so! No politician is perfect but we are happy with our lot, thank you very much. If you have a point to raise you can always stop them down Main Street. And if any of them is found to have a finger in the pot, he’d better emigrate. Something apparently not possible in your once grand country. Catalonia was invaded by the rest of Spain, but that She supported a candidate for the throne of Spain wich finally could not succeed. The Succession War was a civil war within a European war. It is wrong to say that on one side was Catalonia and the rest of Spain on the other. When 2m people plus march the streets…..there no going back and its a matter of time only… when 98% vote against something theres no returning…. when you still believe it the opposite you need to look at yourself long and hard. The feelings of the masses, which must be respected, influence the policy, . But, by themselves, are not policy. You can not to speak about secession ( a thing that frequently involves civil wars,ethnic cleaness and genocides) only because there have been a great manifestation. Besides, these feelings with the passage of time can change. And I do not own Spain, or any region of Spain. Being born in one place or another do not gives me any ownership rights. This is one thing that can not be decided by no one. And can not be bargained. “Por las buenas o por las malas” says ‘español’. Nearly fell of my chair laughing at that one. Oh, we are all terrified. The dictatorship mentality coming out again: do it – or we will force you to do it. “Franco was as Spanish as Spaniards nowadays.” Yes – he was a lovely man. Say it so often and everyone in the world will believe you (no they won’t). Wake up amigo. We’re in the 21st century now. You’re still in the 20th (and evolving backwards). It’s no wonder the Catalans have had enough. What will you do when they vote to go? Send the tanks in (again)? Catalonia can not have desires or rights or obligations, because She is an abstraction that exists only in our minds. Just as Europe or Africa . Democracy can only be applied to those things that can be decided . You can decide whether you are going to do something and how. It decided , but You can not decide things belonging the realm of experience. So you can not decide that the Moon is made of cheese , or that the Earth is flat. Equally You can not decide democratically whether Catalonia is part of Spain ; because it is a fact of existence due to geography , the war called Reconquista , marriages , population movements , and economic movements , etc. . This is something that has been shaped over five centuries , and that none of your ancestors weren´t consulted . Why you do have the right to not have your ancestors ? A right that is not contemplated in nowhere or recognized by any authority and that have no been applied in no where. And what would happen , in 20 years , if all or a part of the population of a Catalonia independent would return to vote in referendum that wants to be part of Spain, France or Morocco ? After reading your criticism of “español”, I guess You’ll agree that keeping a colony like Gibraltar, besides being an anachronism is a mockery of UN resolutions, and a threat to peace. A leading politician in the UK stands down over a £5,800 anomaly. The deputy speaker of The House of Commons stands down after being falsely accused. Yet, Mr Barcenas implicates practically the whole of the PP, including Mr Rajoy, and they are still governing the country. This is the difference between a mature yet modern and evolving democracy and the sham that is present day democracy in Spain. I am but a mere layman but can you imagine the image Spain projects? just to put things straight, Maria Miller actually ripped off the tax payer for over £90K – it was her fellow scumbags that said she only had to repay £5K. I totally agree about Spanish corruption but I think there are an awful lot of Brits who need to see the truth about the UK. Our politicians have as much contempt for the ordinary citizen as the Spanish ones but they are’nt as brazen about it. MOD run by old public schoolboys retired generals and admirals on 100% indexed linked pensions shovelling billions of tax payers money to their friends in the armaments industry. 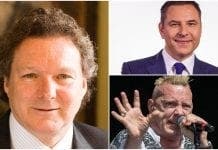 Top Civil Service people who set up private companies in the Isle of Man to avoid nearly all taxes and NI contributions. Totally support the wishes of Gibraltarians but please don’t make out that Britain is so wonderful because it is’nt, leave that kind of denial and unreality to the Spanish – they are far better at it.